CONTROP Precision Technologies and CONTROP USA will be demonstrating the new generation T-STAMP Triple Sensor Day/Night Gyro-stabilized Miniature Payload at AUVSI XPONENTIAL 2016. The new T-STAMP provides improved DRI for an excellent high resolution image that allows for longer range operations. The system is ideal for small UAS (Unmanned Aerial Systems), VTOL (Vertical Take-Off and Landing) Systems, Hovering Aerial Systems, Aerostats and other lightweight aircraft (A/C). The T-STAMP is already operational and proven in dozens of locations around the world. The new generation T-STAMP maintains the same low weight of 3.3 kg with an improved infrared (IR) camera which has a cooled detector and optical zoom lens of 180mm, therefore providing two thirds better focal length in the same lightweight three gimbal package. The T-STAMP gyro-stabilized EO/IR payload includes a Cooled IR Camera with a Continuous Zoom Lens up to three degrees in the NFOV, a Day Camera and an optional Laser Pointer all in a compact camera payload which can be mounted in nose-mount, belly-mount or top-mount configurations. The new generation T-STAMP has recently been supplied to several customers in Israel, the United States and internationally. The STAMP is a family of gyro-STAbilized Miniature Payloads which were especially designed for day and night tactical over-the-hill reconnaissance missions. Lightweight yet ruggedized, the STAMPs provide precise geolocation and can withstand high-shock landings. With low power consumption, the STAMPs incorporate only one LRU and provide the most cost-effective solution of its type for small manned and unmanned systems. CONTROP specializes in the development and production of Electro-Optical and Precision Motion Control Systems. The company’s specialists have over 35 years of experience in EO / IR products for Surveillance, Defense and Homeland Security. 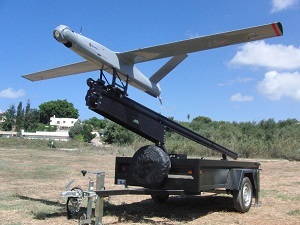 CONTROP’s main product lines include: Automatic passive Intruder Detection Systems for airport perimeter surveillance, coastal surveillance, port and harbor security, border surveillance, the security of sensitive sites and ground troops security; High performance Stabilized Observation Payloads used for day and night surveillance on board UAVs, small UAVs and aerostats/balloons, helicopters, light aircraft, maritime patrol boats and ground vehicles; Thermal Imaging Cameras with high performance continuous Zoom Lens and state-of-the-art image enhancement features, and more. CONTROP’s products are in daily operational use in many of the most critical surveillance, homeland security and defense programs worldwide.